Coming to the completion of my firm's own first holiday home, I am creating a series of some of the homes that inspire me. Holiday homes are the place where clients want to play a little. There's less pressure on domestic bliss and more freedom to explore messy ways of living. And there is almost always an automatic conversation about how the interior of the house works with the land, with nature. Of course, the larger conversation for us all is WHY AREN'T ALL HOUSES CASUAL AND ABOUT CONTEMPLATION OF THE LAND. I'll leave that for another time. 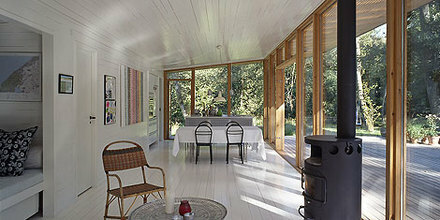 For now just enjoy Christensen & Co Architects holiday home in Asserbo, Denmark. 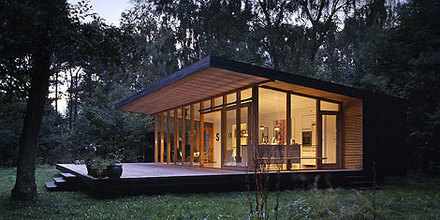 The simple shape, canted roof/ceiling, clapboard ceiling, deep overhang, and big deck. We don't claim to be original.